The iPod shuffle 4th Gen 2 Gb released in late 2012 is identical to the previous 4th generation model in everything except colors and operating system support. The 5 button operating scheme plus the VoiceOver action button on top. The player can speak the name of songs, artists and playlists in 14 languages and boasts the Genius Mixer function as well. That is, Genius can compile a playlist picking up similar songs. The housing is offered in seven colors – dark grey and silver with a black click wheel ring and blue, purple, red, pink, yellow and green with a white click wheel ring. There’s only one 2 Gb version for all colors with battery life up to 15 hours. Introduced on September 1, 2012. Storage capacity: 2 GB (1GB = 1 billion bytes; actual formatted capacity is less than announced). Dimensions: 1.14 x 1.24 x 0.34. Average weight: 0.44 oz. (Weight can vary by configuration and manufacturing process). Navigation: Click wheel on front, voice over button on top. Colors: Silver, dark grey, blue, purple, red, pink, green (original colors). Silver or black with a black control pad or green, blue, pink, yellow, and purple with a white control pad introduced later, as well as Product Red edition model with a white control pad (added in September 2012). “Space Grey” (added in September 2013). Blue, pink, silver, gold, space grey, and Product Red (added in July 2015). Environment: Apple takes a complete product life cycle approach to determining our environmental impact. iPod shuffle is designed with the following features to reduce its environmental impact: BFR-free, PVC-free, recyclable aluminum enclosure. Apple Model No: A1373 (EMC 2400). The fourth generation of the iPod shuffle features the return of clickable track and volume controls from the first two generations. On this model, the control pad is 18% larger than the second generation of iPod Shuffle. Unlike the previous models, especially the unlucky 3rd generation one, iPod shuffle 4th generation shows excellent results with hi-fi semi-professional headphones. There’s no hiss between tracks and the sound is richer. It’s not the top but acceptable result for audio player that small. The fourth generation features VoiceOver from the third generation. It has a devoted physical button and can “understand and speak” twenty-nine languages (Chinese, Czech, Danish, Dutch, English, Finnish, French, German, Greek, Hungarian, Italian, Japanese, Korean, Norwegian, Polish, Portuguese, Romanian, Russian, Slovak, Spanish, Swedish, Thai, and Turkish). This model also features Genius. It can handle multiple playlists. According to Apple, like the previous generation, the iPod shuffle 4th generation supports MP3, VBR, AAC, Protected AAC, Audible (formats 2, 3 and 4), WAV, AIFF and Apple Lossless, and its battery lasts for 15 hours of music. 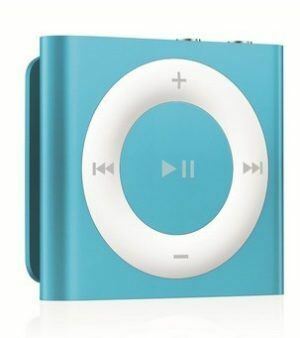 The iPod shuffle 4th generation was originally sold in five colors (silver with a black control pad, green, blue, orange and pink with a white control pad). However, on September 12, 2012, Apple held an event to formally introduce the iPhone 5, as well as a new iPod lineup. The iPod Shuffle remained unchanged, but Apple introduced seven new color options (silver or black with a black control pad or green, blue, pink, yellow, and purple with a white control pad) It also released a Product Red edition model with a white control pad. On September 10, 2013, the “Slate” color option was replaced with “Space Grey”. On July 15, 2015, Apple released six new colors, that’s blue, pink, silver, gold, space grey, and Product Red. PC World Magazine reported a rare problem with iPod Shuffles ceasing normal function, only to flash orange and green lights and become unmountable. Since the Shuffle has no display, the owner cannot read an error message or troubleshoot easily, requiring diagnosis by Apple service personnel. Flashing green and orange lights on the iPod Shuffle indicate that a generic “error” has occurred, according to Apple’s documentation. If the device is still covered by warranty, Apple will replace it for free. This problem has occurred on all generation iPod Shuffles, but it is extremely rare. The built-in rechargeable lithium-ion battery can play up to 15 hours of audio playback. Charging via USB to computer system or power adapter (sold separately). Tests were conducted by Apple in August 2012 using preproduction hardware and software. The playlist contained 358 unique audio tracks consisting of content imported from CDs using iTunes (128-Kbps AAC) and content purchased from the iTunes Store (256-Kbps AAC). Video content was purchased from the iTunes Store. Battery tests are conducted with specific iPod units. Apple warned that actual results may vary. Rechargeable batteries have a limited number of charge cycles and may eventually need to be replaced. Battery life and number of charge cycles vary by use and settings. You can sell your old iPod shuffle 4th generation visiting the website iGotOffer.com: We buy all your old and used electronic devices and we offer the best price online for them: Sell iPod. iPod Shuffle 4th Gen 2 Gb VoiceOver: The public being less than enthusiastic about the iPod shuffle 3rd Generation, Apple engineers turned to the 2nd generation design with clickable ring buttons. For the fourth-generation, Apple brought the iPod Shuffle’s buttons back, along with a few extra features that make the lightest, smallest MP3 player on the planet better than ever. Uploaded by CNET on September 10, 2010.